I can't seem to find any search function in the new Celestia 1.7 64 bit 2017.11.28 version. Is it possible to search for a star using only the name of the star? If it is possible, how can I do that? Unfortunately, the menus of the Qt version of Celestia are incomplete and confusing, including duplicated entries. 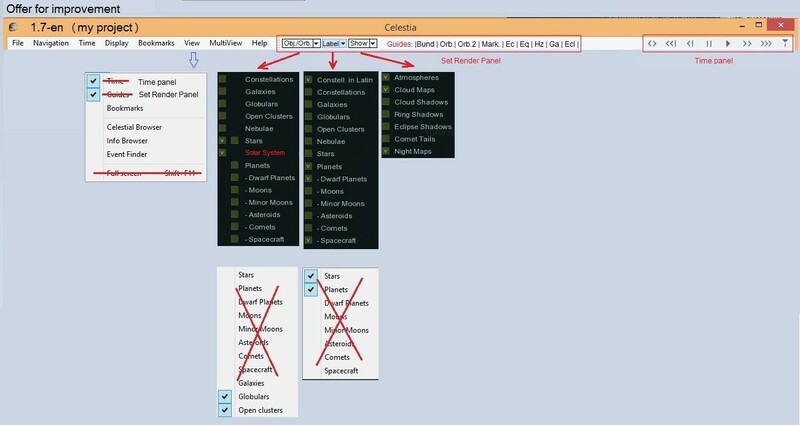 Someone will have to spend some time with them to carefully organize the options and to include all of the functionality available in the previous menu systems. selden, please let's think about what needs to be changed in the Celestia QT dialog boxes. 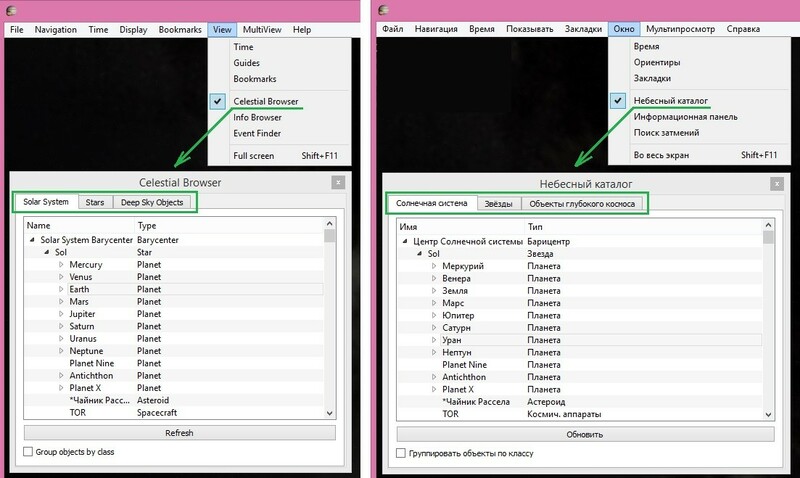 In general, the menu is normal, the settings are completely taken out in a separate dialog. But maybe something is missing. When you think about it, write me a personal message, and let me know what you think should be added to the QT menu & dialog boxes. 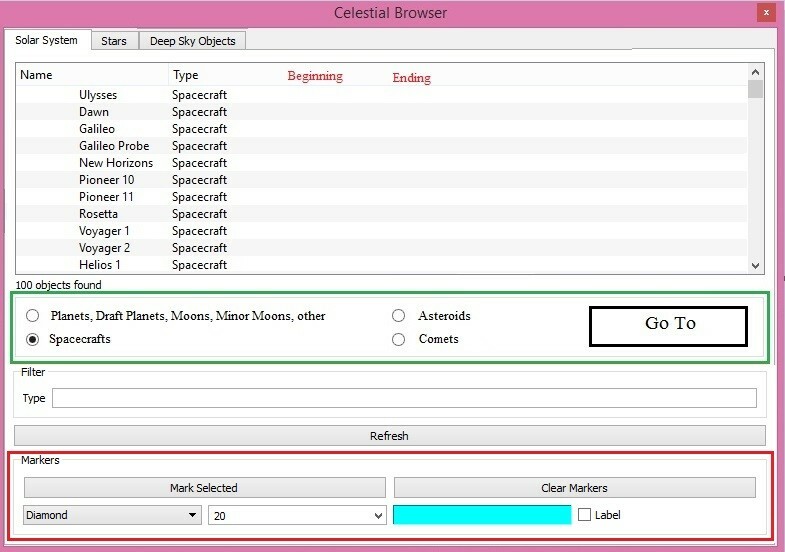 I'll try to make a comparative analysis of the Celestial catalog in Celestia v1.7.0 beta c analog in Celestia v1.6.1. To determine the advantages and disadvantages of The celestial catalog, to offer to make corrections and additions to it. In Celestia v1.6.1 there is a button [Go to], In Celestia v1.7.0. she's gone. in Celestia v1.7.0 there is an additional column "type" of the object. There is a check-box [Group objects by class]. The marking of stars and changing the color of the name of stars are provided. Rounding values in the distance column is incorrect. Different values in the "App mag" column the Sun. Marking stars and changing the color of the name of stars does not work. Sorting stars by name does not work correctly (this problem has already been fixed). All of the above, of course it is necessary to correct! I have additional suggestions for the qualitative improvement of The celestial catalogue. But it's in the next message. 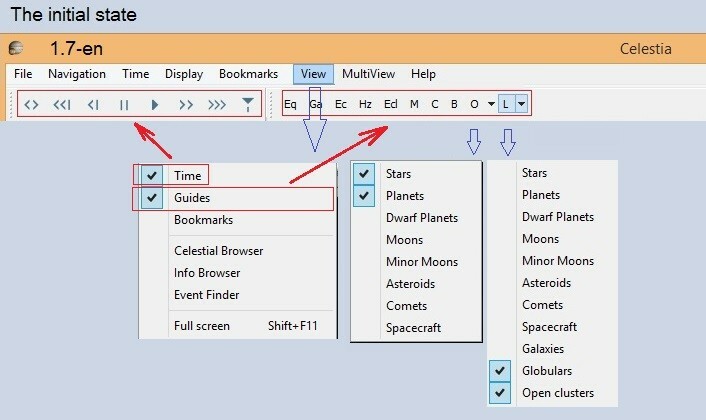 The Solar System tab is not designed well enough compared to the Stars and Deep Sky Objects tabs. Objects in sketch # 1 are not sorted! Objects are arranged in the form of a tree tree. When the fresh button is pressed, sorting is canceled. by the time of the start or end of the operation of the mowing apparatus. All thumbnails must have a [Go To] button to go to the selected object. In all sketches, the "Markers" section should work. I ask in this thread to express my opinion on the improvement of the Celestial catalog. in Celestia 1.6.1, we could sort the different columns by clicking on the title of the column except the name. Is it the same in Celestia 1.7? Did you add the sort by name? This would be very convenient because the number of objects is more and more important. How does this function work when an object has been selected? There is no more Goto button in the browser? Is it enough to double click on the selection? It is true that object parameters could be displayed. Browser menu change is not very important. I think Navigation now matches only navigation commands. Overall, Croc's presentation seems relevant. And it would be necessary to know why differences of measurement appear between his test in English and his test in Russian (for the distance of Sol the difference is enormous). The icons make it easier to manage time. Duplication of existing control functions. The view settings do not cover all the options for setting the kind of objects. Note: The [Orb.2] - orbites à la décoloration. 1. Transferring the Time Panel and the Guides Panel on the menu line. 2. Time Panel is located on the right side of the Menu line. The next step in the modification of the Celestia 1.7 Menu is the removal of duplicate entries, adding the necessary additions, fixing bugs and other improvements. The results will be displayed graphically separately for each Menu tab. I heard his new book would be released in November but I cant see where this is said from any official source ANYWHERE. So where are you guys getting this information from? Version Celestia 1.7 is the upgrade version of Celestia 1.6.1. I found errors in the search system [Enter]. The [Tab] key does not work to navigate the list of objects. 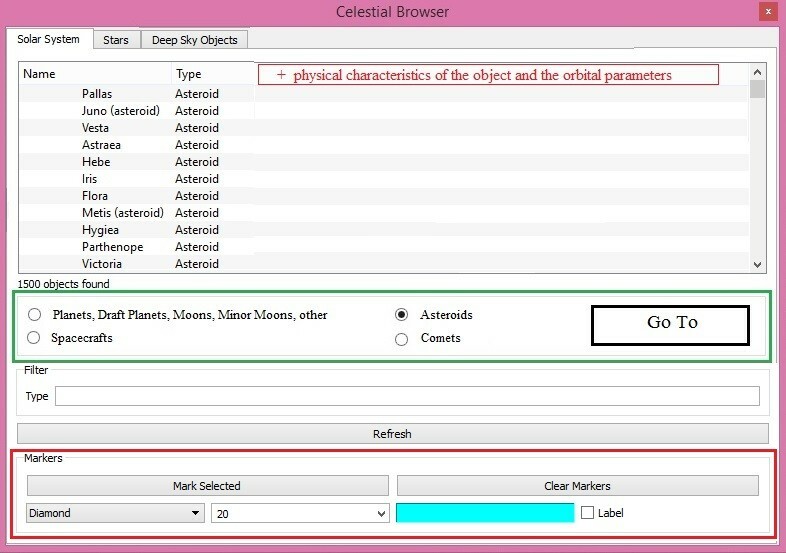 Numerous classes of Asteroids, Comets and Spacecraft must be switched off/switched on as other classes of objects. 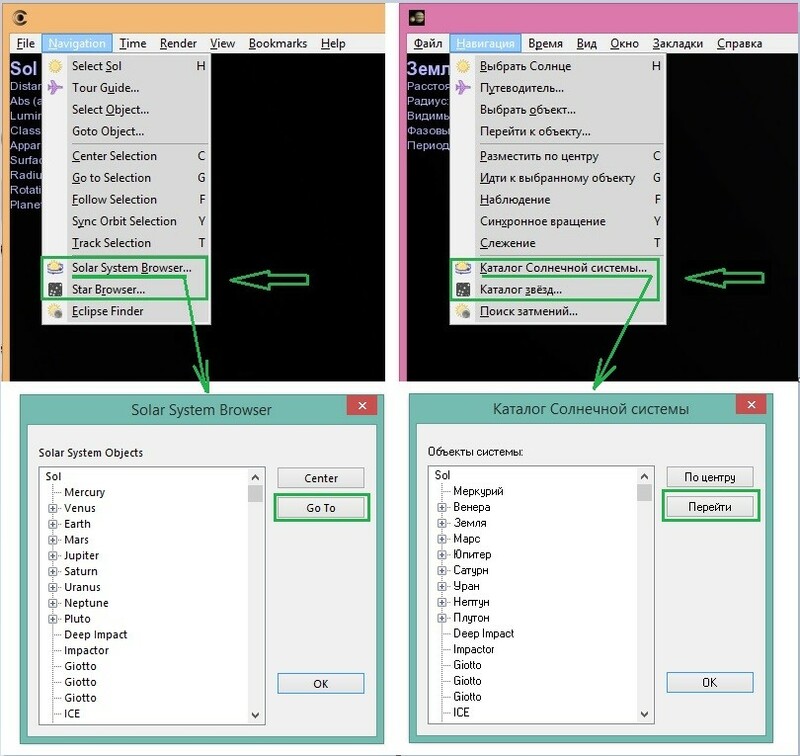 In the context menu, only the moons are displayed and no minor moons are displayed. The yellow frame for nebulae and the green circle for open star clusters. Green circles are the area in which the open star cluster is located. Circles are included along with the names of open star clusters. The yellow frame is the area in which the nebula is located. Frames are included with the names of the nebulae. I totally agree with Croc. But Croc is lucky because that's what I get by wanting to display the name of the nebulae. A solid square covers the model and we can not see anything. So I see the model without the name or I do not see anything.